Sometimes, you just need a quick dinner idea. And Monday was one of those times. I usually go through my fridge/pantry on Monday mornings to see what I’m going to cook for the week. I was crazy busy yesterday, and needed to just throw something together really quick. 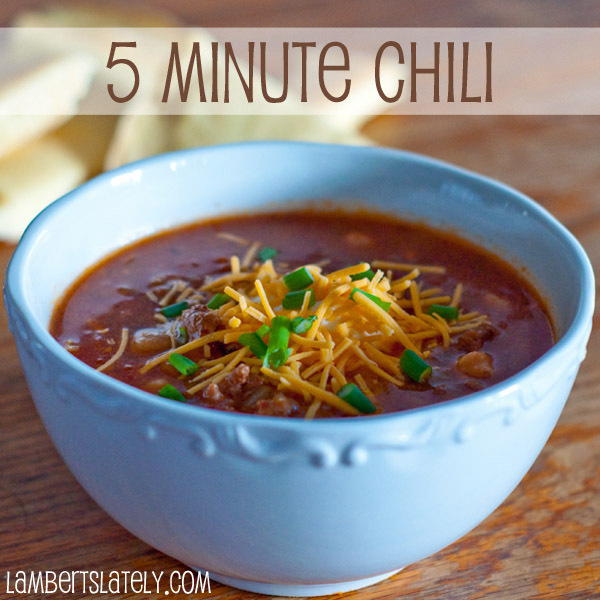 And 5 Minute Chili was born! Literally, it took me 5 minutes to put this in your slow cooker and let it do its thing. This is a perfect recipe for crazy days! 5 Minute Chili Ingredients 3 cans diced Tomatoes (I used the flavored with onion and garlic kind)1 can tomatoes and green chilies 1 can Chili Beans1 can Chick Peas1.5 lbs Ground Beef, cooked and drained (This didn’t take any extra time for me because I cook my ground beef in large batches, and freeze meal-sized portions…makes it so much easier! )1 Onion, chopped2 cups Chicken Stock2 packs Chili Seasoning (I make my own now, so I probably put in 1/4 cup)Salt, Pepper, Garlic PowderCheese, Sour Cream, Green Onions, CornbreadDirections Get a small skillet heating with a little bit of oil. While that’s heating, dump all of the cans (undrained), the chicken stock, the chili seasoning, and the ground beef into a slow cooker. Season to taste with the salt (I used 2 tbsp), pepper (I used 1 tbsp), and garlic powder (I used 1 tbsp). Cook the onion in the oil, just until it is translucent. Dump in the soup mix. Cook on low for 8 hours. Serve with cheese, sour cream, cornbread, and green onions as garnish. 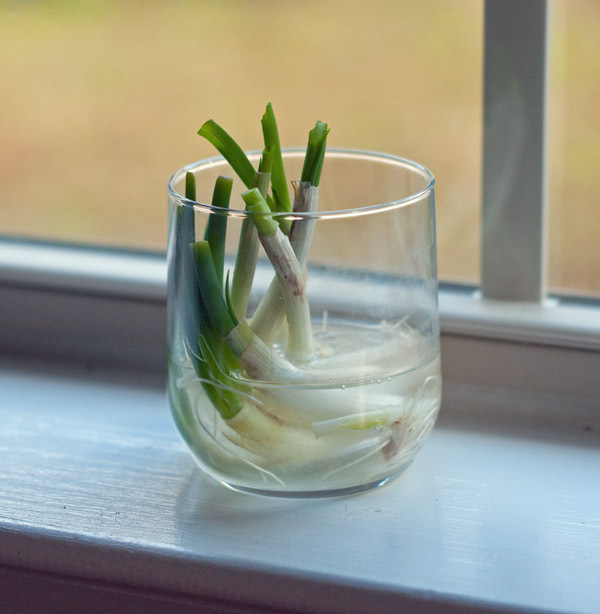 (By the way…did I mention how EASY it is to grow green onions? I remember seeing the tip that you can take the white ends, stick them in an inch or two of water, and set the glass in a window.